The healthcare sector and various healthcare institutions across the globe are rapidly adopting cloud computing technologies. Although there are many concerns regarding regulatory initiatives and security issues, it is expected that this market in the healthcare industry will grow to $5.5 Billion by 2017. This prediction was made in the report published by a research firm named “Markets and Markets”. We all are observing how the healthcare sector is transforming more quickly than ever because of the increased demand of delivering higher quality medical services at lower cost, and with increased competition between various healthcare service providers. A midst this situation, every doctor, clinic owner, research organization and hospital are looking for solutions to increase their productivity by enhancing the quality of service they provide to their clients. They expect these solutions to be less expensive and capable of transforming their services without involving much capital investment. One solution to all this research is cloud computing, which has been the talk of the town ever since its introduction. Cloud computing, if understood, implemented and used strategically can be the most potent solution to satisfy various needs arising in the healthcare industry. Cloud computing gives healthcare institutions an opportunity to improve their quality of the services offered to the patients, share critical and urgent data efficiently, improve operational effectiveness and streamline expenses. Here are just some of the benefits that cloud computing offers to the healthcare industry. Security and Privacy – If you think that your confidential data is not secure when it is stored with a third party, you are mistaken. Cloud computing providers keep updating and strengthening the security features of their servers. 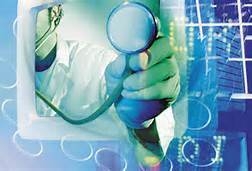 Moreover, they comply with regulations set out in the Health Insurance Portability and Accountability Act (HIPAA). HIPPA recommends all the healthcare institutions to use services of only those cloud service providers who comply with the HIPPA rules and regulations. These address patient confidentiality as well as securing personal data as it relates to patient medical records. Speed – Cloud based healthcare services promise quick and interruption free data transfer within an institution. Also, the infrastucture can be upgraded quickly with no little or no downtime and requiring minimal incremental cost. This allows doctors, as well as patients, to access records and data quickly; This can decrease response times for medical professionals to effectively treat patients in emergency situations. Mobility – Numerous app development companies have realized the importance of cloud computing and developed a number of smart phone apps that can integrate with cloud computing service providers. Numerous smart devices like smart phones, tablets, notebook PC, laptops can collaborate and interact within the cloud infrastructure. Since, the data is stored in the cloud it’s conceivable that any authorized personnel can access it from a smart device regardless of time and location. Collaboration – The situation often arises in healthcare institutions where a patients information is required at multiple locations simultaneously; For example, at the pharmacy as well as the operation operating room or recovery room. Cloud computing allows healthcare institutions to synchronize and share the data at multiple places in a real-time. Decreased Expenses – Since everything works in a cloud, healthcare institutions don’t need to invest large amounts in building / maintaining IT and data center infrastructure; This also reduces requirements for dedicate support staff and other miscellaneous utilities (e.g,. electricity, cooling, lighting, etc.). They only have to pay a fixed amount as a monthly or yearly fee and the rest is taken care of by the cloud provider company. However, despite the above-mentioned benefits, there is a section of experts who considers that it is not safe to implement cloud computing in the healthcare sector as even a slightest error could create issues with a patients’ care. Security of the data is another concern since data is stored outside the institution which can have a perceived increased chance of breach. It’s anticipated that these shortcomings can be overcome by paying more attention to the system and with selecting an appropriate cloud computing service provider. Source: GoArticles by Jennifer Lewis. She is an associate with a Dallas mobile application development company. Backed by a team of extensively experienced iPhone developers in Dallas Tx, they offer enterprise application development to various industry verticals.